Caravan shelter owners will be hard-pressed to find a more useful, more versatile accessory than this Caravan 5-foot Professional 500 Denier Polyester Sidewall. It's so useful because, as all outdoor enthusiasts know all too well, things like wind, rain, and insects can turn a fun afternoon into a total mess. This sidewall provides a way to change that outcome in many situations, and here's how. Ease of use is a key element to this product. This is an 5-foot wall that attaches easily using included Velcro fasteners to the legs and frame top of any Caravan shelter with a 5-foot wall. Once in place, it provides a convenient, secure barrier against all of those elements you'd just as soon avoid. The 100% polyester fabric it's made of is 500 denier material that is strong, durable, and weather resistant to maximize your protection. There are all kinds of reasons to use and to enjoy this sidewall. Many owners find that they have needs that aren't even discussed here, but needs that this product is perfectly suited for. 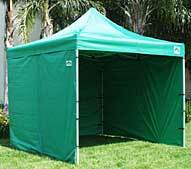 That's why, whether your intentions for your shelter are listed here or not, it might be rewarding to consider adding this Caravan 5-foot Professional 500 Denier Polyester Sidewall to your outdoor shelter. WARNING: This product can expose you to chemicals including Diethylhexyl Phthalate, which is known to the State of California to cause cancer, birth defects, or other reproductive harm. For more information go to www.P65Warnings.ca.gov.